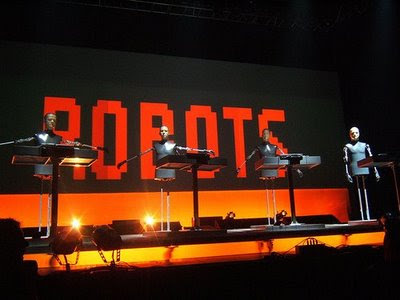 Florian Schneider has announced he is leaving Kraftwerk. Kraftwerk will continue as a band but with only one of the original founding members, Ralf Hütter still in the line up. Florian didn't perform with Kraftwerk during their 2008 tour so it's not a huge surprise that he has chosen to step down from the bridge. "Florian Schneider leaves Kraftwerk after a 40 years partnership with Ralf Hütter. This partnership has generated an incredible music and huge advances in music technology. Florian is a great musician, always seeking the perfect sound through technology. Refined and perfected sounds and vocoders to impossible levels of perfection. Our thanks for the state of art that led to Kraftwerk's music all these years. And our wishes for success Florian's new projects as well as to this new Kraftwerk." Ralf Hütter, Henning Schmitz, Fritz Hilpert, Stefan Pfaffe (who replaced Florian Schneider). This is the order from left to right as they stand on the stage. At the end of last month, it was announced that Kraftwerk will be supporting Radiohead on the South American leg of their World tour.